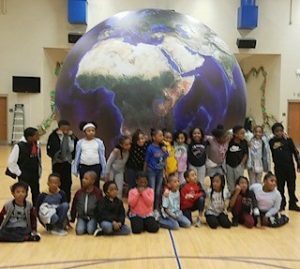 Orbit Earth Expo Visits the Students of Erwin Montessori! 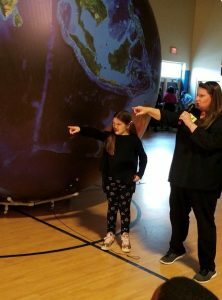 GREENSBORO, NORTH CAROLINA – SparkPoint Innovations brought its astronomy program, Orbit Earth Expo to the students of Erwin last week! Tracy had a great time with the kids walking through the patterns in our solar system. How are day and night created? What causes the pattern of morning, noon, evening, and nighttime – is it rotation or revolution? We were so excited to learn that the school follows Montessori teaching and they do an exercise similar to our demonstration that helps us learn how the moon, sun, and earth work together! Their students walk around the sun once for every year of their life. They loved seeing this connection to their curriculum, especially when we added the moon to the mix. Those fun second grade teachers decided to nominate one of their own (Mr. Snyder) instead of a student to be the moon. He tried to keep up with orbiting around the earth, but then decided to walk beside her and move the moon around her with his arm. Smart thinking! Thanks for being a fun group!